We collect bee pollen from all types of flowers. A bee can only take 2 grains of pollen from each flight. 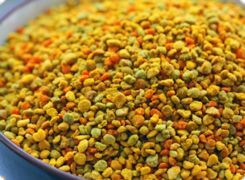 The bee pollen is dried using high quality technology immediately after the beescollect it from the flowers. Our supply abilities go up to 6 metric tons per year,with a minimum order quantity of 300 kg. 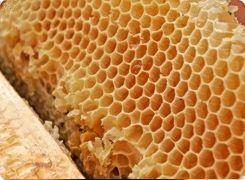 The ingredients of beeswax includeabout 50 different chemical compounds. Among these are: esters (75%), hydrocarbons (12-15%), free fatty acids (13-15%). The composition of the wax also includes colors and flavors. The main parameters characterizing the properties of wax are: density, temperature, viscosity, solubility, interaction with metals. The chemical composition of pollen has a large concentration of valuable nutrients and physiologically active substances useful to humans. 100 g pollen contains about 70-80 g dry matter - it is 7-36 g protein, containing much of the vital amino acids, carbohydrates - 20-39 grams / mostly glucose and fructose /, fat 1.4-20 g, nucleic acids and trace elements - 1-5.5 g.
Beeswax is used to produce high-quality candles. Unlike paraffin, it is a purely natural product.